Back in 2011 and 2012, I did two reviews on different book series that I’d come to enjoy. I was still in the middle of them, but I was pretty much hooked on them, enough that while I hadn’t finished either series at that point, I wrote reviews on both of them. Sadly though, the reviews didn’t really do either series justice. I was still figuring out the components of a good review at that point in my blogging career, so that probably explains why they weren’t as good as they could be. In any case, I read the last book of one series earlier this year and last night I finished the last book of the other. In honor of these achievements, and because I haven’t done a proper review since August, I thought I’d do a double review on both of these series. 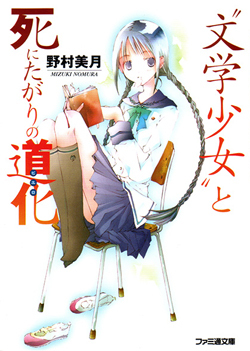 Volume 1 of “Kieli”. I swear, the series blew my mind when I first started reading it. Everyone loves a unique story, something that has never been seen before on the printed page. We felt that way with Alice in Wonderland, Lord of the Rings, and so many other famous stories. Kieli does just that. A light novel series* out of Japan, Kieli mixes just about every genre possible: paranormal, science fiction, steampunk, fantasy, romance, Western, and then some! All while telling a very compelling and heart-wrenching story. From a young age, Kieli has been able to see ghosts, but she doesn’t tell anyone lest her theocratic society think her a heretic. One day she meets an immortal soldier named Harvey, who is delivering a haunted radio to a battle site so that the ghost haunting the radio can finally be at peace. Thus starts their adventures together, as Kieli joins Harvey on his quest and ends up helping him fight off ghosts, Church soldiers, other immortal soldiers and a plethora of other antagonists. At the same time, Kieli starts learning about her past and about what it means to grow up and be an adult. While at times it may frustrate readers that Kieli has a hard time separating her own identity from being with Harvey, it’s a compelling story. The characters are troubled and have to learn to sort out their own problems as well as the antagonists facing them, and the mix of genres is done almost seamlessly without looking too weird or contrived, and the relationship between the two main characters feels real. You’ll want to keep reading all the way through the final book, which nearly made me come to tears. All in all, I give Kieli a 4.5 out of 5. This was a series that made me want to create fantastic worlds like the one depicted int he series, and I wanted to create characters that felt just as vibrant and complicated as Kieli or Harvey. Maybe thanks to Kieli, someday I will. The Japanese cover for the first entry in the “Book Girl” series, “Book Girl and the Suicidal Mime”. Another Japanese light novel series, Book Girl is told from the point of view of Konoha Inoue, a troubled high schooler who actually published a massively popular novel under a pseudonym in junior high. However his success came at the great cost, and he swears never to write again. That is, until he meets Tohko Amano, a girl who literally eats the stories told in books to survive. After Konoha sees Tohko “eating” a story, she forces him to join the literature club and write stories for her as snacks. That’s only the start of his problems though, because a lot of strange stuff tends to happen around Konoha, including missing students and attempted murders. Against his will, Konoha is often dragged into solving these mysteries by Tohko, who often finds a literary equivalent to the mystery being investigated (such as Wuthering Heights or The Phantom of the Opera, in some cases). While Kieli made me want to create worlds, Book Girl made me want to tell incredible stories with wonderful language. Nomura is able to weave words together in order to make you feel like you really know the characters, especially Konoha, and become really attached to them, as well as attached to finding out how the mystery is solved, as well as how Konoha confronts his past and learns to stand on his own two feet again. It’s a great series if you happen to love mysteries as well. For telling a compelling story with wonderful clarity, emotion and language, I give the Book Girl series a 4.8 out of 5. I really will end up missing this series now that I’ve finished it, but hopefully I took enough away from it so as to improve my own stories. Well, that’s all for now. I’ve got some homework to do before I go over to my mother’s house, so I’m going to get to work on that. Happy Thanksgiving, my Followers of Fear. This year, I’m thankful for you guys. *A light novel is a form of literature that was born in Japan and grew out of the pulp magazine industry. Light novels are usually around the length of a novella (40,000-50,000 words), have dense publishing schedules, are often serialized in anthology magazines before being published as cheap paperbacks, and usually include illustrations, about one per chapter usually. The format is very popular in Japan and popular series have been adapted into numerous formats several times over. There’s also a growing market in the English-speaking world for light novels, and many companies have begun licensing and translating these series for new audiences. I’m hooked on the genre myself.